Image credits, from left: Kwame Brathwaite. Nomsa Brath wearing earrings designed by Carolee Prince, AJASS, Harlem, ca. 1964. Courtesy of the artist and Philip Martin Gallery, Los Angeles; Kwame Brathwaite. Photo shoot at a public school for one of the AJASS-associated modeling groups that emulated the Grandassa Models and began to embrace natural hairstyles. Harlem, ca. 1966. Courtesy of the artist and Philip Martin Gallery, Los Angeles. 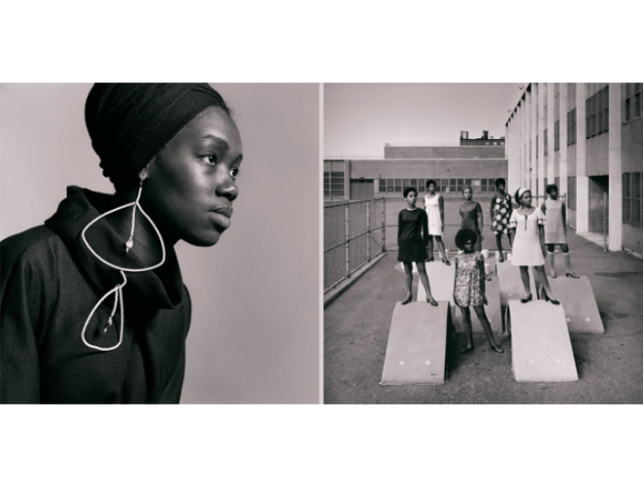 Black Is Beautiful: The Photography of Kwame Brathwaite is the first-ever major exhibition dedicated to Kwame Brathwaite (b. 1938), a key figure of the second Harlem Renaissance. Inspired by the writings of black nationalist Marcus Garvey, Brathwaite combined his political vision with the medium of photography to effect social change. Featuring over forty photographs of black women and men with natural hair and clothes that reclaimed their African roots, Black Is Beautiful illuminates how Brathwaite’s body of work challenged mainstream beauty standards that excluded people of color and exemplified how art can propel us toward greater equity and inclusion.